Back in late 2016 when I was cutting out all those sleeves to sew up, I cut some caul bags out of the leftover fabric scraps. The Lochac Lids Hat Challenge seemed like a great opportunity to get one finished at last. I trace around the top of a bucket to get the pattern for the caul bag shape (I have a large head). I chose a circle of grey cotton velveteen and marked chalk lines in a diagonal pattern. Then I hand sewed some narrow commercially produced black ribbon in a large grid or net pattern. Once the ribbon was sewn down, I added some large wine coloured red glass beads and put four gold glass seed beads around them. For the band of the caul, I measured around my head (in the area that you would wear a headband). I added 3cm extra for seam allowance (2 x 1.5cm). I worked out how wide I wanted the band and multiplied by four. This allows me to turn the two edges into the centre and then fold the band in half to enclose the edge of the caul bag. Once you have your band cut out, sew the ends together. I flatten the seams out and stab stitch down to reduce bulk, but this is a matter of personal preference. Once you are happy with the decoration and have your band prepared, you are ready to assemble the caul. If your caul bag fabric is very fine or needs lining for some reason, this is the stage where you would sandwich your two caul bag/circle pieces together and tack them so they don't move. I find that velveteen is stable enough not to need lining, and lack of lining also reduces heat. I live in an area which is very hot over summer, so this is a bonus. If you live in cold climes, adding a lining to keep in the heat might be a good idea. To assemble the caul, you will need to put gathering stitches around the edge of the caul bag/circle piece. I set my stitches in about 5mm from the edge and make the stitches about 1 cm apart. A running stitch works well for this step. I usually mark the centre top and centre bottom of my circular piece and gather each side separately. I find that doing it this way makes it easier to manipulate the gathers and keep them even and neat. I have made several of these cauls, and I have recently been experimenting with not gathering the part that goes over the top of my head (roughly five centimetres above each ear.) 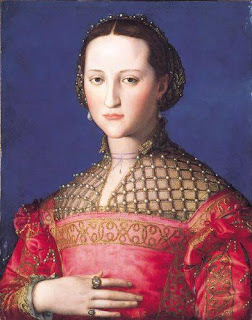 With some of my cauls there is a lumpy bunching that sort of sticks up in that area, and I notice that in the Italian portraits from the sixteenth century the caul usually sits quite flat. Fabric choice and head shape probably has something to do with this - it is entirely personal preference how you do it and what suits your face/head. I prefer the flatter look. Once your gathering stitches are in (and knotted with loops at the end in case you get over enthusiastic and accidentally pull the stitches out), start gently pulling your running stitch tight. You need to gather the bag/circle part up until it fits into the band. If you are not gathering the area that goes over the top of the head, you can just pin that part into place. I put the edge of the circle/bag part up against the inside centre fold of the band. Once the caul bag has been gathered up to fit the band, start pinning it into place, making sure that the gathers are neat and even. Then start hand stitching the band into place. Once the band is sewn down on the outside, turn the band and bag carefully inside out. Pin the band into place on this side, making sure all the edges of the caul bag are still tucked in neatly. Then sew it down. Once it is all sewn, remove any tacking stitches holding the band together and cut off the ends of your gathering threads. Alright- at this point the caul is basically finished. You can add decoration to the band if you want to. When I was making this one, I thought that the band was a bit bare, so I decided to add a few lines of the black and gold ribbon. I choose to finish off the caul by sewing a comb into the inside of the band in the centre, and adding two wig clips that sit a few centimetres behind my ears. You could omit this step and use pins if you would prefer a more period way to attach the caul, or even bobby pins. I have unruly wavy hair that always seems to escape near my ears, so wig clips work for me. Some images of the finished project. The photographs make it look quite dark, but the velveteen is a mid-grey and the wine coloured beads are brighter than they appear in the images.